Only Ben needed lunch today, and I found a perfect way to use out some of the leftovers in our fridge. We had a roast beef in the crockpot on Monday night (yum, fyi) and I had a fair size piece leftover, but not enough for more than 1 adult. Instead, it turned into a lovely sandwich filling for Mr. Ben, who came home with an empty box! 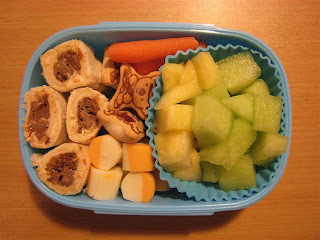 He had faux sushi with roast beef and white cheddar/roasted red pepper spread, some cheese cubes, carrot sticks, pineapple and honeydew, and a few koala cookies. Yummy and bright!